Going against their recent trend to cheerlead for everything downtown Tampa, the Tribune today stumbled into the American Dream in the suburbs of Tampa, Hear the boom? That's Pasco County development. They moved in January, leaving Cary, North Carolina, to be closer to family, to live near a big city but not too close, and to make the change to a good school district before their two girls got too entrenched in kindergarten and first-grade classes. Brian and Courtney Wine did what roughly 10,000 people a year are doing — setting up house in one of the dozens of subdivisions and apartment communities sprouting up in Pasco County, most just over the line from Hillsborough County, another area booming with commercial and residential development. Despite the attention of the urban activists and "walkable, livable" communities, the real action continues outside the urban core, in the suburbs and exurbs, and in this case, Pasco County. Much of the development in Pasco is around the SR 56-54 corridors in south Pasco, which are far enough away from Tampa to enjoy more space and privacy, yet close enough to commute for work or a Bucs game. It tends to be cheaper to live in Pasco as well. 125,000 live in the south Pasco area now, which is expected to grow to 320,000 in 15 years. This is consistent with what we noted in this blog recently, that the growth continues outside of Tampa, not within. 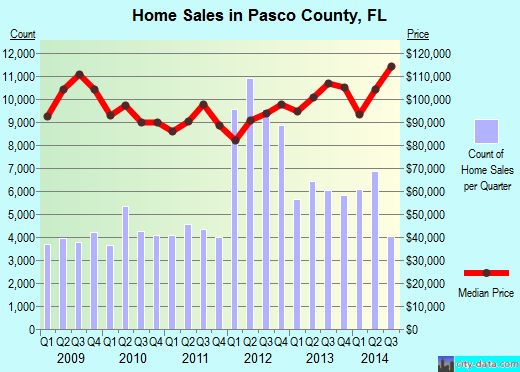 As a proxy of economic vitality, how many homes have sold in Pasco recently? Pasco County is selling over twice as many homes as Tampa. That's not a fluke, its been going on for over 6 years now. Homes in Pasco are also much more affordable than Tampa. Do you think that might have some benefit? Even though we may think of Pasco as "way out there", certainly from South of Kennedy crowd, the average commute time to work is 30 minutes, not too far off Tampa's 22 minutes and Hillsborough County's average for 25.8. Pasco has grown to 470,391 (91% urban, 9% rural); it was 344,765 in 2000, or about 36%. Tampa's population in 2013 was 352,957 (100% urban, 0% rural), or about 16.3% growth. What is fueling such growth in the area? Is it the economic recovery in Hillsborough and Tampa, with the urban area spreading north over the county line? Is it affordability as Tampa land prices skyrocket and Pinellas County remains largely built out? Is it the attraction of a roomy new family home with a big yard versus urban living? 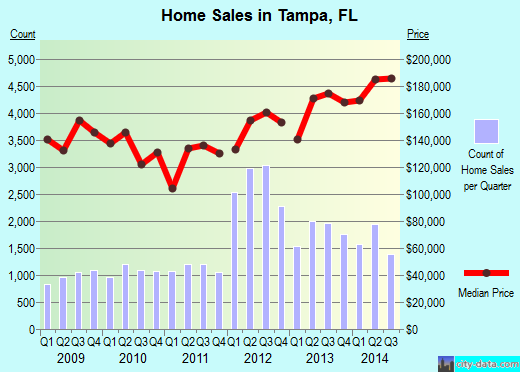 “It’s probably a combination of all those things,” said Marvin Rose, longtime Tampa Bay area housing market tracker. But he and other real estate analysts are watching for the south Pasco area to emerge from its reputation as Tampa’s “bedroom community” to become a self-sustaining, jobs-providing, live-work-play center of its own. It should be no surprise that Pasco is growing. It has been growing for years, much faster than Tampa. People live where they can afford to live, and balance that with many factors, from space, privacy, schools, proximity to work and activities, etc. Yet it seems to be a surprise to some that people are spending their valuable time and hard earned money and choosing to live in Pasco County. South Pasco developers, meanwhile, don’t seem to be impressed with calls for housing geared toward “millennials,” those who reached young adulthood in the early 2000s and are expected to become the biggest segment of the U.S. population. Studies have shown that millennials want to live close to work, want to be in walking environments, and don’t necessarily favor larger homes. Not an issue, say Pasco real estate watchers. Not too many young parents dream of raising a couple of children in an 800 square foot apartment on the 32nd floor just because it has a hipster coffee shop on the ground floor. Even Tampa Mayor Bob Buckhorn, local champion of urban living, acknowledges suburban life isn’t going away. Many of Buckhorn's actions lately are constraining the American Dream, such as giving up on roads. Perhaps with the growth outside of Tampa, he should be planning to accommodate people who will be coming and going in and through Tampa. Here's a hint. People are not moving to Pasco, or Fishhawk for that matter, to take the HART bus into Tampa. Of the estimated nearly 200,000 new residents in south Pasco in 15 years, and another forecasted 600,000 in Hillsborough County in 25 years, few will be riding transit. They'll still want their cars. And yet the American Dream is alive and well in Pasco County. Hillsborough County's land use policies and planning have been driving development and new sales and property tax revenues North into Pasco County for some time now. If you want to build a house in NW Hillsborough, you have to buy 3.5 acres, min. Gunn Hi-way and Van Dyke may not be widened according to the Hillsborough Comprehensive Plan. Both of these county roads are evacuation routes and Van Dyke is an emergency route. The same plan has stringent requirements on any development.